﻿At the Tora Hakutsuru Kan Martial Arts Academy Inc. we are dedicated in teaching Matsumura Seito Shorin Ryu Okinawan karate-Do. We offer karate classes and private lessons for kids and adults. You are never too old to start martial arts training. Our martial arts style was passed down to us from Master Phillip W. Koeppel, founder of the USKK. ﻿Here at the Tora Hakusturu Kan Martial Academy, we are dedicated in keeping old traditions alive. We teach old family style Matsumura Seito Shorin Ryu Karate-Do. This Okinawan fighting system was passed down from Soken (Bushi) Matsumura to his grandson, Nabe Matsumura and then to his nephew, Hohan Soken. This was never taught in the school systems nor was it intended for sport. 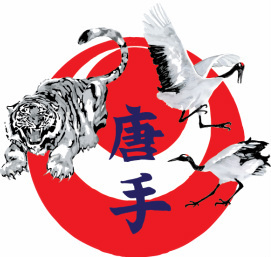 It is in pure form, one of the oldest styles of Okinawan karate. See our History page for a thorough look at this Old Pine Village style, and the lineage of teachers who taught it, and continue to teach it. $65 a month. Discounts for Students, Law Enforcement, and Military. ID Required Please.